Break the monotony of scrubbing dishes with these amusing sponge holders. 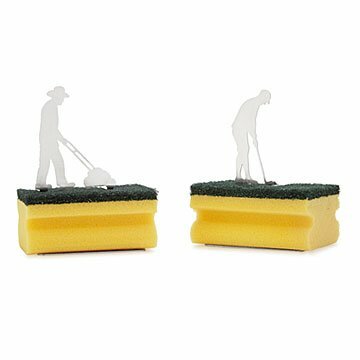 These miniature figures are convinced your sponge is an eternal patch of grass. We didn't have the heart to tell them. Set the amusing sponge holder by your sink to break the monotony of scrubbing dishes. A golfer or lawn-mower makes for great company as you clean, then holds onto your sponge, keeping things clean and dry. A great gift for pals who putt or friends with a silly side, it's just the playful design they didn't know they needed. Made in Germany. Includes sponge, suction cups, and mounting strip.